From the moment we unlocked the door and stepped inside we were blown away. The photographs don't do the property any justice. We enjoyed our time there so much I had a diﬃcult time getting our group out of the house! The kids enjoyed every ﬂoor of the house including the yard. Moose lodge was truly a magical place. Everyone in our group wants to make this home an annual tradition. 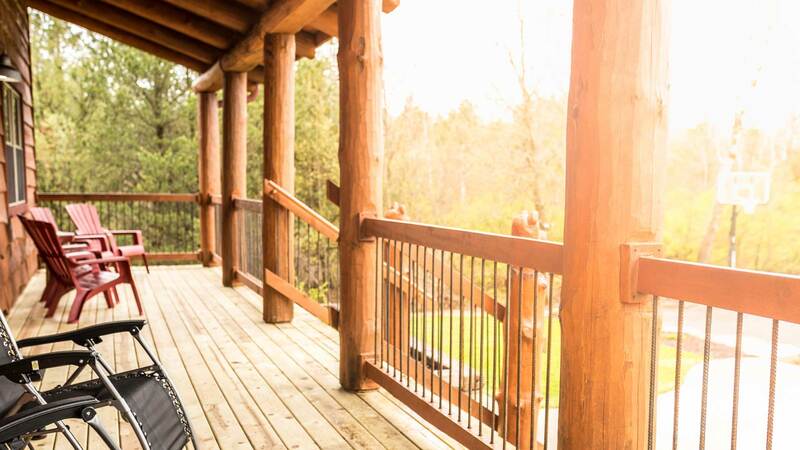 The Moose Lodge is a beautiful log cabin with everything you need. The beds are very comfy and bedrooms had more than enough room for all our stuff. The kitchen is well stock with all you would need to make meals. You are just 5 minutes from the downtown and all the waterparks. My family had a wonderful time. We watched a thunderstorm from the front porch on our last night there. We have lots of pictures and great memories. Thank you Moose Lodge! I highly recommend this house for a family vacation. Clean, prepared, amazing decorations, the perfect renter. We love Sondra! Top of the line. Private and a Country Oasis that is perfect for Family Reunions. We absolutely loved everything, from the renter to the property, to the distance from town. The cutest decorations that were classy! Amazing kitchen with everything we needed. The kids and adults loved it! This place was amazing. After busy days of having fun with family it was so nice to come back to beautiful and clean quiet place and relax. I even brought some extra stuffs after staying many other places but everything was well stocked didn’t need it. Thank you so much for let us enjoy our family vacation. 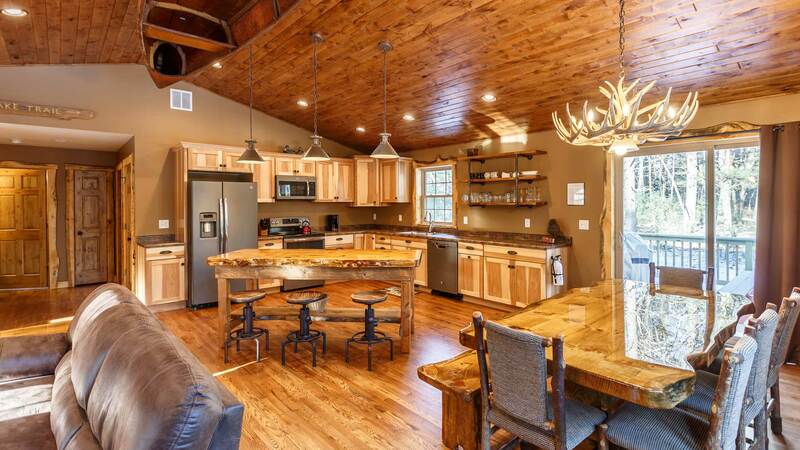 Amazing place for family to gather, just minutes outside of everything The Dells has to offer. Sondra was great to work with on everything from the initial booking to refunding our security deposit the same day we checked out. You will not be disappointed with this home and it has plenty of room to fit large families. Thank you for making our experience such a positive one! Our stay was wonderful and home was perfect for our group! Property is beautiful both inside and out. Outside is tree-lined, private and peaceful with plenty of room. Inside is meticulously clean, nicely decorated and well-stocked. Sondra was very responsive to any of our questions before and during our stay. I would definitely return and highly recommend this rental. Gorgeous house and property. Very well stocked and clean. We brought our whole family (my mother-in-law and father-in-law, their children and all of their grandchildren) to the Wisconsin Dells for the week of June 25-29. We decided to rent the Moose Lodge in place of 5-6 hotel rooms and it was the best decision! Everyone had their own space, when wanted, and the living room/dining/kitchen area is big enough that we could all be together as well. The backyard is massive and has a great camp fire set up. There is plenty of things to do in the Dells but we also enjoyed just hanging out around the house. Sondra was very responsive with any and all concerns or questions that I had. Instructions were very clear and the house was very well supplied. The house itself is well kept and clean. Linen and towels were plentiful and clean. I would highly recommend staying at the Moose Lodge and our family will for sure be back to stay again. Spacious and beautiful, set back in the woods--peaceful! We truly enjoyed our stay with a family of 11! So much room and very clean and organized. It would be helpful if stocked with charcoal for the grill and paper towels for the kitchen. Minor concerns, but all in all, it was wonderful and I will recommend to others. Our group of 15 had an awesome time staying at the Moose Lodge! The lodge is large enough to accommodate a large group and has plenty of amenities. The backyard area is perfect for outdoor activities and the location is only a few minutes outside the heart of the Dells. The basement area was great for our large group and the air conditioning worked well over the 90 degrees plus weekend. We are looking forward to coming back in the near future! Wow! Blown away by the serenity and character of this lodge! So much room and plenty of things to do here. Shopping and wine tasting within a short drivng distance. Noticed a little leak from main floor pipes into the pool room but the owner was thankful for the notice and did try to find a Saturday plumber. Very wonderfully polite owner and easy to talk to. Plenty of kitchen gadgets, appliances, plates, glass's, towels, utensils. Plenty of space to hang out inside and outside. Decor is tasteful and lodge layout was perfect. Very well kept! Loved it, seriously considering coming back to the Moose Lodge again next year! Thank you Byers! Nice cabin in a quiet area just outside of town. We had a wonderful time at Moose Lodge. The accomidstions are fantastic. We unfortunately had bad weather and lost power at one point during our stay. Sondra was so helpful with contacting the electrical company and keeping us updated as to the expected return of power. We definitely recommend this location and will likely return in the future!!! This was a great spot for our whole family. The cabin was clean, kid friendly and exactly what we needed to celebrate a birthday. The weather didn't stop us from using the great outdoor fire area. It has been updated from these pictures so its even better! The location is far enough away from the crazy tourist stuff of the Dells but just 15 minutes and you can get anywhere into the Dells and an hour and you are in Madison. We are already trying to find some time next year to book this place again. My friends and I had a wonderful time at the Moose Lodge! It's spacious and has all the amenities you'd want for a weekend away from Madison. Highly recommended! Excellent option for Wisconsin Dells area! This was perfect for our family getaway! There was plenty of space to accommodate and the quality/cleanliness of the home was excellent. Located just outside of Wisconsin Dells, we were able to feel secluded and away from the action while still being within close proximity to everything in town. Because the home was so great, we only left once to get dinner and stayed in the rest of our trip. Owners were helpful and very responsive – overall great choice for anyone considering! This was our 9th year of girls weekend in the Dells and this Cabin was by far our favorite! The entire facility was so clean and relaxing, we all felt so comfortable and didn't want to leave. The house is very spacious to accommodate a few families or several people. The two big bathrooms and 1/2 bath met our needs of 8 women. The location of this property is just outside the Dells, we felt it was perfect. We had nothing negative to say about this place - it's amazing. Next year we can't wait to come back to this Cabin! What a wonderful retreat in Wisconsin Dells! The house was wonderfully taken care of and felt like a rustic retreat in the middle of the woods. We had a group of 15 adults and we never felt cramped in this home. There are 3 living/family areas where each guest can retreat to. We will definitely be back! Thanks again Sondra. This was a work retreat and we all enjoyed it very much! We shall be back again next year. Moose Lodge was a perfect place for our family to have a special birthday/New Year's celebration. The home was comfortable and spacious enough for our family of ten adults. The fire pit was our daytime gathering spot and the center of our outdoor activities because the temperature never got above zero during our stay. Too cold for skiing or snow tubing. The kitchen had everything we needed and the large kitchen table sat all of us for meals and board games. Pool table was great and entertainment area in the basement was perfect for the countdown to 2018. Beds were comfortable and showers perfect. We plan to come back to Moose Lodge for another stay during the warmer months. Thanks Sondra!! Great time at Moose Lodge!!! Thank you so much for welcoming us into your beautiful cabin! The cabin was extremely roomy and cozy with our large group of 17 people (8 adults and 9 children). Owners were extremely easy to work with and cabin was fully stocked with everything we needed and more. Took the kids skiing and tubing at Cascade Mountain, which was close. We had a wonderful time relaxing at Moose Lodge and would definitely stay again when in the area, thank you so much!! We had a great time, everything was very clean and just like the photos. Had a great time with long time friends. Very nice home. We had a great time at Moose Lodge! For the last few years my husband and I have hosted our friends for a Friends Thanksgiving meal at our home. However, this year we decided that because of our growing group it would be best to rent a space to accommodate everyone at one place instead of having people stay in hotels etc. Moose Lodge was the ideal place for our Thanksgiving tradition. The kitchen was well stocked with the equipment we needed to cook, the space was perfect to entertain everyone before and after our meal and the sleeping accommodations were comfortable and just what we needed. The Byers' were lovely to work with and we hope to be back again next year! We highly recommend Moose Lodge! The Moose Lodge is a beautiful home that was comfortable for our entire family. The decor and furnishings were wonderful. Loved the rustic but very modern style. The family loved the lower level with big screen to watch football and the pool table. Lots of sleeping space, lovely bedrooms and bathrooms, family room, and kitchen. Everything was great! Unfortunately, the weather didn't allow us to take advantage of the backyard or the outdoor fire pit, but the that space was very nice as well. Thank you, Byers, for a wonderful place to accommodate our family! This was a perfect retreat location for our women's group. We were shut in for the weekend to rejuvenate, relax and plan for 2018. And the house and location could not have been more perfect. Secluded yet with Internet and free from distractions. Thank you for a great weekend and accomodations. We had a truly fantastic time at this lodge! It served as the staging and lodging point for our wedding at Mirror Lake state park. 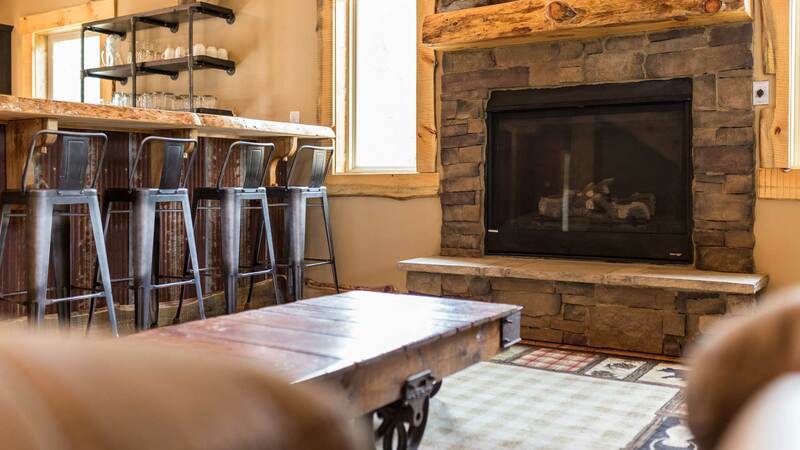 The lodge is very well equipped with amenities, dishes, and electronics. The back yard and surrounding parking is secluded enough from the road and neighbors so that you get the sense of isolation without the long drive. The front and back porches are truly spectacular. The lodge also has plenty of room for large groups as we didn't feel crowded at any point during the weekend. Beautiful property - secluded, attractive. Home is solidly built with so much character. Our family celebrated our 50th anniversary for the weekend - our children, grandchildren and great grandkids all came. All loved the property and the house. So much fun around the campfire in the yard. Very good comments about the great mattresses and pillows giving great sleeps. Everything was so clean and so many supplies were included we needed little more than food and toothbrushes. The booklet prepared for visitors was such a help with everything from info about the house and property to the area surrounding the Dells. We called Sondra with a question and she answered immediately. Everyone enjoyed the experience so much we are considering another visit next year. Thanks for a great celebration venue! An awesome place for a getaway! Our group had an awesome time! The lodge was in great shape and in a fantastic location. Would highly recommend! Amazing house and everything else! This place is amazing and the host Sondra is great! Thank you so much and I hope we will be back in the future. Beautiful home. Has all the amenities. Accommodated our family really well. Great location close to attractions. We had a family get-together at Moose Lodge and had a fantastic time. The home is as advertised and had plenty of space for all of us (12 adults, 4 kids). The house was clean and well-maintained. The outside property was quiet and beautiful. The kitchen was stocked with all the essentials for cooking meals, including large fridge and dishwasher. Washer/dryer worked great (bring your own laundry soap). Loved having the baby gates at the tops of the stairs. We loved the large living room open to the kitchen/dining area which provided ample space for all of us. We got a lot of use out of the basketball hoop, fire pit outside, and pool table in the basement. Also loved the swing set for the kids. The dining table was large and there is also a card table and chairs so we could all eat together. Also, the two picnic tables on the back deck were great. The grill was nice (charcoal, bring your own charcoal). There was a high chair and pack n play available for the younger kids. The shared bathroom space was a little tight (2.5 baths, one of which is full bath in the master suite, no bathroom in basement), but we made it work. Owners were very responsive, check in and check out processes were smooth. Overall, Moose Lodge was fantastic, and we would definitely stay there again! Great place. Well kept and comfortable. A great family place for a get-together! We had a great time. Everything was very nice. With 9 kids age four & under, and 10 adults, we all kind of held our breath upon arrival, nervous that we had made a mistake in planning this trip with 5 families in one house. But it was so great! There was enough space, beds were comfortable, there was a high chair and pack and play and little kid chairs already there, and had a great outdoor space for the kids to run around. Loved the firepit and how big it was. Also loved that they had a small playset with swings (even a baby swing), and a slide, and a sand box. It was perfect for our littles. Also an awesome front porch the parents lounged on during naptimes, and great back deck with awesomely big picnic tables that we could all fit around and eat at dinner time. Obviously sharing bathrooms was a little tight, but we did put most of the kids in the jacuzzi for bath times, and it worked great. Moose Lodge was a wonderful place to gather with family for our 50th anniversary celebration, It was very clean, well stocked and ready for us. Nice to have a dishwasher. Rooms were spacious. Loved the open spaces for different ages to spend time. The yard was wonderful and well groomed. Swing set - a big plus along with sandbox! Used the basketball hoop often and the chairs on the large front porch. Nice quiet location. Plenty of parking. Fire pit well designed and furnished with seating. Great deck with two big tables - perfect for our family meals (weather cooperated!). We sprayed for bugs and used mosquito coils and didn't have any problems with mosquitoes at all. We would all (eight adults and seven kids ages 6-15) recommend Moose Lodge for a family get away. Did miss having a bathroom in the basement with the two bedrooms down there, but we made it work with the 2.5 baths upstairs. Nice to have three TVs available along with good seating in all locations. All in all, we'd go back there if we ever get to that area again. Moose Lodge was a great place for us to celebrate our 50th Anniversary with our family. We had a great time at Moose Lodge with the whole family. The place was great and very clean when we checked in. It was just as nice as the pictures looked on-line. The owners were very nice to work with, if you had a question or a problem. They were right on top of any problems, excellent customer service!!! We loved our stay at the cabin, and will come back again for sure. We had an amazing time at Moose Lodge! Five stars! We recently travelled to the Dells and stayed at the Moose Lodge. There were 11 of us ages 67 to 5! We had an absolute blast and the house was just perfect for us! We played outside, made smores in the fire pit, played pool, played basketball and overall just enjoyed relaxing at the house. The house was clean and had all the comforts of home. My only suggestion is more silverware! Simply because we had 11 people and had to handwash utensils right after we ate one meal to have enough for the next. But that is a minor detail. :) I would HIGHLY recommend this property! Sondra was easy to get a hold of and was very responsive with answers to my questions. Thank you for a great family vacation!!!! It all started with this great house! Perfect for family fun! Plenty of room for everyone to relax and enjoy time together! Lodge had everything we needed. Large yard to play games, and campfire for roasting marshmallows! Extra bonus with playground/swings/sand box for the kids. Owners very accommodating! The house was wonderful! Would recommend this lodge to all our friends! Perfect for our extended family getaway! We were looking for a place for my extended family to get away together, and we couldn't have asked for anything better. The house is beautiful, well-kept and spacious enough for a large group to not feel cramped at all. And the yard was perfect to let all of the kids run around for hours! And just a few minutes outside the action of the Dells, we couldn't have asked for more. Would highly recommend! Absolutely gorgeous house and land! Could not have asked for a better experience. Everything was perfect. We loved this home and property. Everything you could possibly want or need to make your stay enjoyable. Sondra is so assessable and answers your e-mails quickly. Everything was very clean. We appreciated that fact. We would choose this property again. Thanks for a wonderful stay. Beautiful home, wonderful relaxing stay, great hosts! We took our grown children and six young grandsons to the Dells for a special trip. Staying at the Byers' beautiful home made our time even more wonderful as a family! It was great all being together under one roof, rather than spread out in various hotel rooms. We all still enjoyed our privacy and scheduled around the home's three bathrooms, two showers. The log home is beautifully decorated, comfortable, and Sondra and Leon made sure our stay was perfect upon our arrival. Sondra also answered my many questions, as we were preparing ahead for our family stay. The kitchen is well stocked with all we needed to prepare the meals we brought for our large family. We enjoyed an evening around the fire pit and games in the nice yard. It was quiet and private...except for the noise our own numbers made. The grandkids loved the swing set and the space. It was a short drive to the Dells for our planned activities. We hope many others find this beautiful home away from home for their stay near the Dells! We would definitely book again if we're visiting the area! This house was the perfect home away for us during our stay! Comfortable beds, plenty of space, great bathrooms. The outside area is beautiful and the firepit is perfect. Thank you! Absolutely beautiful home! The perfect getaway to enjoy time together! We stayed at the Moose Lodge for a 40th birthday surprise and it was everything we were looking for and more! Plenty of room for everyone and lots of space! The home itself is gorgeous and the outdoor area is so peaceful. The location provides privacy yet minutes away offers so much to do and see. There's a book in the home which offers great tips and suggestions of ideas for your stay which was appreciated especially since I'm not familiar with the area! Sondra was easy to converse with via email and everything one would need is provided, it truly is a home away from home. My only regret was we didn't stay long enough but now we plan to stay again! We had such a great time celebrating a golden birthday this weekend! 4 couples and tons of room to cook, play games, and spread out. What an amazing property! We were a group of 14 adults, and we wanted a get away to watch the first round of the NCAA basketball tournament. This was the perfect place to spend a weekend. There was more than enough room to spread out, and everyone got a bed! The basement was perfect for entertaining, and the kitchen/outdoor area was great for meals and yard games. Sondra and Leon were great to work with and very responsive to any request. We will be back!! We spent a weekend with family at Moose Lodge. The property is very nice and easily addressed the needs of our family. We will definitely come back again. We had a lot of fun playing basketball, relaxing on the porches (great chairs btw), the fire pit had stumps/wheelbarrow for ease of use, there was ample outdoor tables for all and two charcoal grills! We had 6 married couples and 2 newborns with us and each floor having a living room was handy! Thank you! Everything was amazing! We had a wonderful time!! I still can't get over how clean and put-together the lodge was. Every detail was thought-out, from the barrel sinks to the wood everything. We had a great time, and would come back for another Wis Dells visit! We rented this cabin for the weekend for my birthday and we loved this place. This cabin is very spacious and cozy with plenty of sleeping space to accommodate a large group. It's close to town and everyone is super friendly around there. Overall, we had a great experience. Rustic, warm, spacious! Thoughtful amenities. Met and exceeded my expectations. Fun nights playing games and being cozy. Awesome! This cabin is quite roomy and the details of the decor were amazing. Thanks for a great stay! This is a beautiful cabin in the Dells but tucked away on almost 3 acres of land. We loved staying at Moose Lodge! We had great communication with the owners, even though we booked last minute during the holidays. The home felt like a cabin in the woods even though you were in the Dells. We snowshoed and even zip lined in the middle of winter. We wanted to show our group of kids that you can have fun outdoors during the winter, and we really pushed them out of their comfort zone. They loved the experience! It was always nice to come back to a cozy cottage and have hot chocolate around the fireplace. We had a group of 8 and there was more than enough space. We will definitely return! Thank you!!! The space was great. We appreciated the baby gates at the tops of stairs but would have loved one more at the bottom of the stairs to upstairs bedrooms - especially with the open back stairwell. Linens and beds were comfortable and clean. Access was easy and owners were helpful. Convenient but secluded and peaceful location. Wonderful getaway cabin for your family and friends! We had an absolutely amazing time at Moose Lodge this past weekend! I highly recommend it for large groups. We had 12 people share this well-maintained and beautiful house. Enough beds for all and a stocked kitchen for our mealcooking needs. We stayed in all weekend (we got about 12" of snow but had no plans to leave anyway) and played board games, ate yummy food, laughed and enjoyed our holiday event with family and close friends. Sondra was very responsive to emails and questions prior to the event as well as during when we needed to connect for snow removal. We all thought the bound-book with house details, rules and local attractions was priceless. Everyone loved the house and we hope to stay there again soon! This house is so roomy and cozy. 8 girls spent the weekend here and had a blast. The house is fully stocked and decorated so cute. Would recommend this house! We had a very good time there and the owner is very nice and sent all the information we will need before our trip. When we arrived, we all loved the style of the house. This is first time we stay at a moose lodge and it looks great. The house is very clean, have enough space and rooms for our group. It has everything we need during our stay. The location is great. Very private in the woods and quiet. There is a golf course and water park about 5 minutes away and takes about 10 to 15 minutes to the downtown area where you can find all the store, bar and parks. Will rent again during our future trip to Dells! Myself and 13 friends rent a cabin for "friendsgiving" in the Dells area every year and everyone agreed that this year was one of the best cabins we have rented. The cabin is very clean and accommodated the 14 of us very well. The location was great being very private and less than 10 minutes form the main strip of shops, restaurants/bars in the Dells. The pool table in the basement was great and the space provided great group areas as well as private areas if you wanted to get away and read. Sondra was great to work with and even got us early check-in which was great. We will look at returning next year and recommend Moose Lodge for anyone looking for a great cabin in the Dells area! Rented this lodge with 4 other couples for our Friendsgiving reunion. The lodge is great for groups - lots to do (even when it's cold out). We had a daytime fire outside to make smores and play basketball outside. The kitchen is spacious and great for entertaining a big group. Bedrooms were comfortable and the lodge was clean. Would definitely recommend and would come back again! We could not have been more pleased by the amenities, the hospitality, and the setting. The owners are some of the most caring people we have ever met. They went out of their way to make sure that our stay was the best ever. We definitely will be back. Lovely house for a group. Great woodsy feel and close to everything in the dells. Great place to have with a large Group! The owners had everything ready for us and plenty of room for our group of nine. We had such an amazing time. Sondra was so helpful and attentive. Everything about our stay was perfect. The blouse was absolutely beautiful!!! We will definitely be back again!! The absolute Perfect place to stay whether for a weekend or a week. Serene setting back in woods with lots of room and space to enjoy. Home was spot -on clean and well stocked with pretty much everything you need. Loved all the lodge deco and furnishings...a truly 'warm' environment to kick back. Sondra was always quick to respond with any questions and info you might need. We celebrated my brother-in-law's 60th birthday with 12 adults. Sat outside by firepit at dusk ...perfect night! Is just a short trip into town and a few miles to Fawn Creek Winery ( a Must if you haven't been to). Had live entertainment and lots of seating. Overall..We loved our stay at Moose Lodge...would highly recommend! My only suggestion ( and this was comment from rest of family as well) is to maybe put wall mirrors in each bedroom. Makes getting ready for us women (makeup/hair) easier as to not be tying up bathrooms when everyone is getting ready around the same time. Would definitely stay here again! Beautiful property and home- comfortably slept all 15 guests. Close to downtown WI Dells (Broadway Street). Sondra was extremely easy to get in contact with and was more than willing to answer questions! Would recommend this cabin to a friend. Our party of 12 had a great experience at the Moose Lodge. Beautiful place in a great location. We had a very nice quiet getaway. The lodge is very clean and comfortable. Fast wifi was a nice bonus! Sondra was very nice checking in before and during our stay to make sure we had everything we needed. Would highly recommend to anyone looking to visit the Wisconsin Dells area!! Very spacious, clean and comfortable - the setting was perfect, too! Our family loved the cabin from the moment we arrived, the house was clean & well maintained. We felt like we were at our own home away from home. All of our children are grown & there was plenty of room to spread out and enjoy different areas of the property. The kitchen was well stocked for us to cook, the laundry area was a huge plus and the basketball hoop & pool table got plenty of use! The owners were easily accessible, and took care a slow draining tub within the hour. We were close enough to the Dells, Cave of the Mounds and lakes to explore and have fun. We definitely recommend this vacation rental at Moose Lodge to others, and want to come back soon! The house is great. It's even more spacious than the pictures and very well appointed. We were a party of nine and we're all very comfortable. The fire pit in the back yard was a big hit and everyone loved making and eating smores. The beds were very nice and there are so many rooms! The kitchen is all you would want for making excellent meals. It was a great trip! Thanks! Beautiful cabin in a great location! We thought this cabin was perfect for our vacation. Cabin is beautiful and set up very well. We loved having the washer/dryer & beautiful kitchen. We kept busy so we never had a chance to take advantage of the firepit but the kids loved the basketball court. We will definitely look at staying here again. Everything went very well. Thank you! What can I say - Moose Lodge was the perfect getaway for our 3 families! It was roomy and spacious for 7 kids and 6 adults - the basement became the ultimate 'kids cave'. If the kids weren't outside playing yard games or making smores at the fire pit - they were downstairs hanging out - allowing the adults to hang out! The house is meticulously clean and well taken care of! We were all greatly impressed! It had everything we needed - from kitchen supplies to sheets and towels! Use of the washer and dryer is always handy -especially with kids. And downtown Dells was just minutes away! The owners were so kind and responded back to us immediately - they even gave us a bag of WI cheese curds to welcome us - what a nice touch! I'd definitely recommend this place to anyone looking for a Wisconsin getaway! We are definitely coming back to Moose Lodge!! Thank you so much to the Byers' family!! My friends & I stayed at the lodge for just one night & everyone was impressed with the cabin. The home is well-kept, clean, and is on a great location where the water parks are easily accessible. Sondra was very receptive with minor issues we encountered at her place (i.e., slow internet & leaking jacuzzi) & available to help. Overall, we had a good time however short we stayed at the Byers' place. We had very high expectations heading into our stay, and the Moose Lodge exceeded every one of them! It is in a great location. We felt very secluded, but it was only a few minutes drive to all of the activities in the Dells. The home itself was beautiful and spacious and had every amenity we could have asked for. We spent as much time in the yard as we did in the cabin. Playing games, BBQing, campfires, even dancing in the rain. 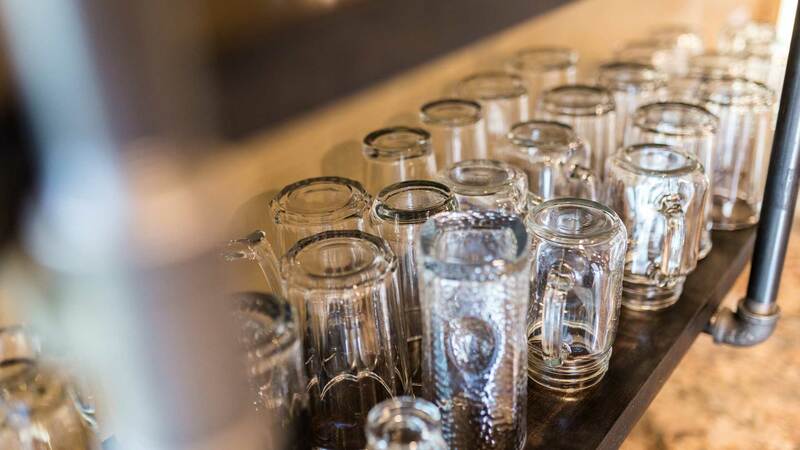 The owners were exceptional in their communication and you can tell they take a lot of pride in ensuring their guests have the best stay possible. I highly recommend a trip to the Wisconsin Dells and a stay in the Moose Lodge!! Great home away from home! Sondra thought of everything! First impressions: we loved the winding driveway through the forest from the main highway to get to the house. It seemed so secluded as if the house were the only property for miles - our own private hide away! When we first saw the house, the adults exclaimed WOW and the kids said, "It's gigantic !" Once inside there were many many more WOW's from everyone. The great room was really great with enough room for six people on the couches several people on the floor playing games and sitting at the bar between the kitchen and the family room eight people at the dining table plenty of room in the kitchen for several people to be working at one time. The highchair, pack and play and baby gates were invaluable ! There were five bedrooms and a loft with a pullout. There was Plenty of room there for everyone to be comfortable with privacy for all. 2 1/2 baths were more than adequate for our 7 adults six kids and two babies. We used the washer & dryer almost every day and the dishwasher daily. Moose Lodge was well supplied with necessities for daily family living. The front porch had chairs enough for eight people which many of us enjoyed. The deck off the kitchen is also very large with the table and umbrella and four chairs and a picnic table. The property itself is large enough for this group of Adults and children to have a water fight that drenched everyone. The adults also enjoyed playing basketball on the driveway. Since it's only a five minute drive from the attractions in Wisconsin Dells, we were able to go to town enjoy the water parks and we only had a short drive back to the lodge. The lodge itself is nicely appointed in a rustic manner. The kids were fascinated by many of the wallhangings and toilet paper holders. We all felt right at home and we would definitely recommend Moose Lodge for a wonderful happy joyful get away! Great property and house. Plenty of room inside and outside. Good location to the Dells. We had 3 families meet back in our home state of Wisconsin along with family members visiting us at the home who still live in the area. We all had a great time hanging out at the house and enjoying activities in the area. Moose Lodge was clean, comfortable and overall a great vacation spot. The hosts Sondra and Leon were top notch hosts in all areas, especially communication. Very clean and comfortable home, well prepared for your stay! Great family getaway location 10 minutes from the dells. This place was amazing! The inside gives you a true cabin feel with all the amenities that you will need to make you comfortable. We had a large group and we didn't have to worry about a thing. The owner was a pleasure to work with and was very helpful in making our stay welcoming and easy. Inside was a guide book for check out information, Wifi password, and local attractions. There was plenty of outdoor seating to enjoy the nice weather and relax while enjoying nature. It was comfortable, peaceful, and just plain amazing! I am definitely interested in renting this place again in the future! An absolutely fantastic place to stay! This is a great getaway spot for a large get together with family and friends. We had 3 families totaling 14 people and were very comfortable. The house features 3 finished levels with great decor, large hangout areas and plenty of bedrooms. Outside the property you are surrounded by woods, with a swing set for the kids, basketball hoop and a great campfire ring with plenty of seating. It is very close to a ton of attractions and downtown Wisconsin Dells. The owners are very responsive. I highly recommend this property. Loved the big yard in the back. There was plenty of Room for all the yard games we played. Lots of Room in the Cabin, we didn't have to worry about where people were going to sleep. Great location. Everything was wonderful. We will defiantly try to get back there. Awesome place, very accommodating, nothing I can think of that would of made better.